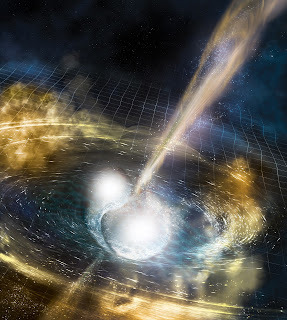 First Observation of a Neutron Star with Gravitational Waves and Light! At about 8:41 am EDT on 17 August 2017, both LIGO observatories recorded a 100-second long gravitational wave (GW) signal that appeared to be coming from two neutron stars orbiting each other and merging together (this detection is called GW170817). 1.7 seconds later, the Fermi Gamma Ray Burst Monitor detected a short gamma-ray burst (GRB). 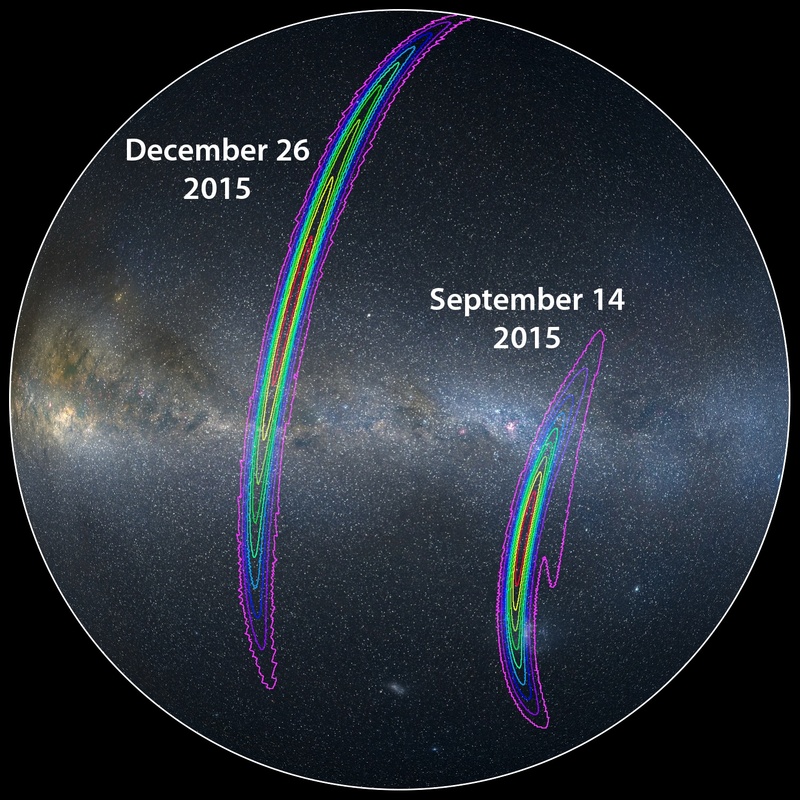 LIGO's online data analysis, along with Virgo not detecting the event due to its location in a part of the sky it isn't sensitive to, narrowed down the possible location of the gravitational wave source to the constellation Hydra (in the Southern Hemisphere) which overlapped with the area determined from the GRB detection. Both the LIGO and GRB detectors put out circulars alerting the astronomy community to the independent discoveries; an event like this was unprecedented and became a priority target for observation. LIGO also produced a luminosity distance (a method of estimating the distance to the source) of about 130 million light-years. 11 hours after the gravitational wave and GRB detections (the delay was caused by the time it took for the Earth to rotate observatories in South America into their nighttime sky), the 1-m Swope Telescope in Chile observed a new point of light (referred to as a transient) from galaxy NGC 4993, also about 130 million light-years away! Approximately 70 other observatories, both on our planet and orbiting it, observed this new source of light: 11.5 hours after GW/GRB detection, infrared light was observed; 15 hours later, ultraviolet light was observed; as the days went on, the optical light from the source became redder (longer wavelength) and dimmer than the early days; 9 days later, x-rays were observed; 16 days later, radio waves were observed. Left: GRB data (top) collected by Fermi and gravitational wave data (bottom) collected by LIGO. The cause(s) of short GRBs have been the subject of much theoretical research; the predominant theory is that they are caused by the merger of two neutron stars or a neutron star and a black hole. The problem is that light isn't capable of bringing us information about these kinds of systems. So, we've seen many short GRBs, we have ideas about how they are made based on these observations, and have been waiting for evidence to either support or refute the theory. Fortunately, gravitational waves bring us the information about the system that light can't, like the masses of the objects and how they moved around each other. This is the first conclusive evidence that at least some of the short GRBs are created by neutron star mergers. Light observations allowed us to observe the rapid fading of the brightness and gradual lengthening of the wavelength (reddening) of the light which is a signature of a kilonova explosion. Kilonovae are also thought to be the source of most of the heavy elements in the universe. (I have previouslyattributed these to supernova here; further research has shown that while a supernova can make some heavy elements, it can't make enough of the heavier ones like gold to account for the amounts we have.) Breaking the light down into its different wavelengths (colors) tells us about the composition of the source or of elements being created. 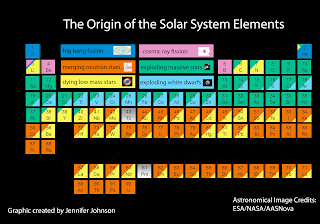 Measurements like this showed that heavy elements were indeed created as predicted in this kilonova and supports that neutron star mergers may very well be the source of most of the heavy elements in the universe. The timing of the arrival of gravitational waves and the gamma-ray burst (1.7 seconds later) are our strongest support yet that gravitational waves travel at the speed of light. Detecting gravitational waves first is not unexpected since this system has been producing gravitational waves its whole life and we only saw the last 100 seconds of it. It is the dynamics of what happens during the merger that produces the light in the form of a GRB, so we should expect a delay. Even when considering different possible ways and times for light to be made in a system like this, our observations are consistent with the prediction that gravitational waves travel at the speed of light. WHAT DID THIS NEUTRON STAR MERGER CREATE? A remaining question that the observations we've made hasn't been able to answer is: What did this neutron star merger create: a very large neutron star or a black hole? We simply don't know and the reason why is that we don't have a firm understanding of the equation of state (EOS) for a neutron star (EOS is a technical term for describing matter and how it behaves). Depending on different possible EOSs, we can get either a small black hole or a very massive neutron star at some time after the merger. We also looked for gravitational wave evidence of which it is since a small black hole would have produced gravitational waves at about 6000 Hz and a very massive neutron star would produce them up to 4000 Hz. The LIGO detectors are not very sensitive at high frequencies, making finding evidence for a resultant black hole impossible. 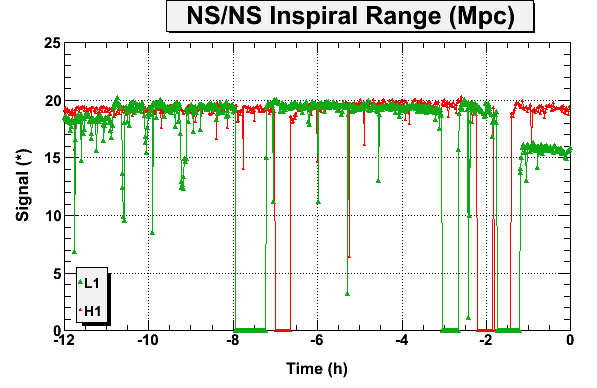 We did search for gravitational waves consistent with the formation of a very massive neutron star until the end of the run on 25 August (8 days later) and didn't find anything. We found nothing to support either possibility so we simply don't know! This is the true beginning of multi-messenger astronomy! As was referred to in this post, gravitational waves, light, and neutrinos (looked for during this event but none were found) bring us different information about the universe. Gravitational waves tell us about how mass moves around and how much of it there is; light tells us about temperature, and composition; neutrinos can bring us information about the nuclear reactions happening deep within a star. The effort to make and share all of these observations require not just scientific knowledge, but cooperation on a large scale. There are many things that divide us in our societies; this is something we should be proud to unite us! Second Anniversary of the First Detection and a New Job! While posts here have been long awaited, I've been busy doing research, teaching, and changed my job! 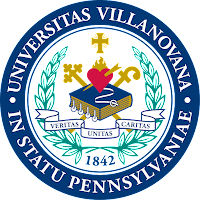 I've just started a new job as an assistant professor at Villanova University and an academic job search is quite intensive (perhaps I will write about finding a faculty job soon). Also, I've been writing some other things. I've written a TED-Ed video/lesson on gravitational waves and it premiers today (you can view it here), I have a PhysicsWorld Discovery text on "Gravitational Waves" coming soon, and have written a few other things here and there. 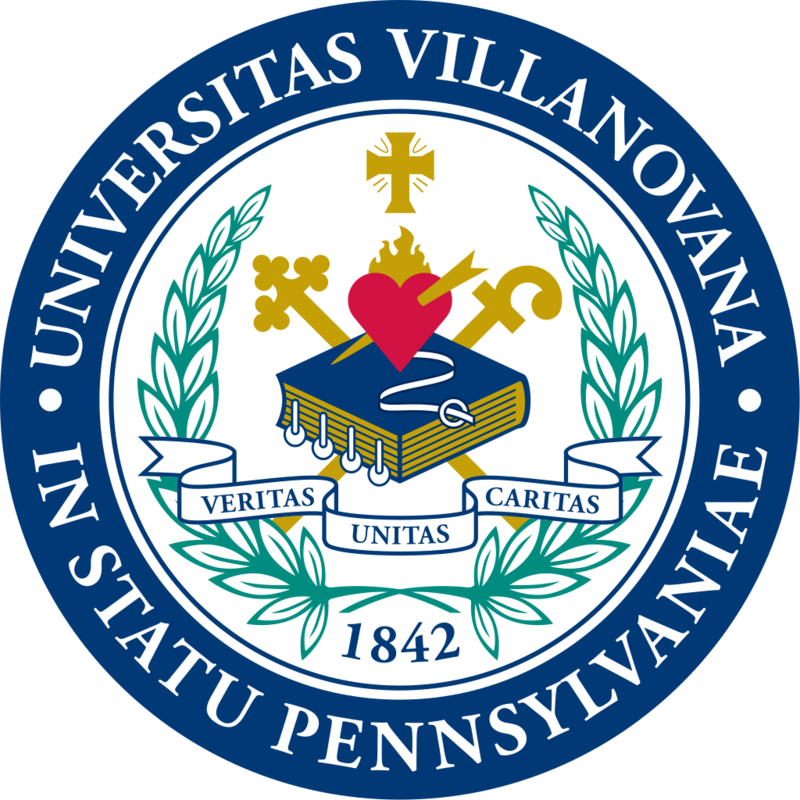 So, now that I've moved from Baton Rouge to the suburbs of Philadelphia, I have some time to talk with all of you again. ANNIVERSARY OF GW150914: WHERE IS IT NOW? The colored area on this map shows the most probable source of the detected gravitational wave where red is more likely than purple. The location is shown against a map of the night sky centered on the Milky Way galaxy with constellations outlined. The source of GW150914 was from the general vicinity of the constellations Volans and Carina. That means that it is traveling towards the stars in the constellation Draco. It hasn't encountered much. Since it has traveled a distance of 2 light years from Earth, it is still in our Milky Way galaxy (the radius of the Milky Way 60,000 is ly and its disk is 2000 ly). It has not encountered any other stars (the closest star in Draco is Struve 2398, a binary system of red dwarf stars 11.6 ly away) and therefore no other planets. That means that no other life forms have detected GW150914 and won't reach Struve until early 2027 (give or take for the error in our understanding of its distance). Since I wrote last, we announced the discovery of a third detection of gravitational waves from another binary black hole system dubbed GW170104. A black hole 32 times the mass of our Sun merged with another black hole 19 times the mass of our Sun resulting in a single 49 solar mass black hole after radiating away 3 solar masses in gravitational waves. 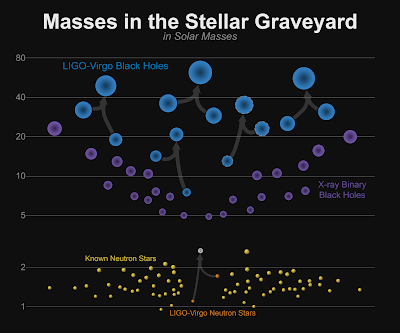 Among other things, this detection helps to fill in the range of masses we've observed; gaps would imply that there is something preventing the formation of those kinds of systems and that would be unexpected. This system originated from about 3 billion light-years away: farther out in the universe than any of our previous detections. Using a gravitational wave that has traveled such a distance allows us to test a part of general relativity that we haven't been able to before: do gravitational waves disperse? For example, when white light enters a prism, the different colors (frequencies) of light travel at slightly different speeds causing them to separate or disperse. General relativity predicts that different frequencies of gravitational waves should not disperse. There are alternate theories of gravity that make predictions of how dispersion will affect a gravitational wave. We compared our observation to standard general relativity and the alternate theories' predictions and found our observations to be consistent with general relativity. That is, we did not observe any significant dispersion of our gravitational wave! We've also done all of the tests of general relativity that were done for the previous detections and this gravitational wave continues to affirm that general relativity is correct. We also were able to investigate the spin of the black holes. For as mind-blowing as a black hole is, it is completely described by three numbers: 1) its mass, 2) its spin, 3) its charge (this is postulated by the no-hair theorem). Since we believe the electric charge of astrophysical black holes to be negligible, physicists get very excited about the mass and the spin. The mass is not too hard to measure (we can get that pretty accurately from the waveform shape and frequency evolution), but the spin is all in the details of the signal which makes it more difficult to estimate. But we always still mention it because any information we get about it will tell us more about the other half of the back hole's story. For this detection, we were able to extract information about how the combined spin of the black hole system compares to the direction of its orbital angular momentum. Basically, does the direction the effective spin of the black holes (on their internal axes) go in the same direction as their orbit? For example, the Earth spins on its axis in the same direction as it orbits the Sun, so this is a positive alignment, but the Earth's axis is tilted so it isn't a perfect alignment. If most of our black hole systems have small misalignments that would support their formation through something we call "common envelope evolution" (I wrote about this here), which is a complicated way of saying that the stars that formed the black holes were always paired together and once they both died you end up with a binary black hole system. The interactions between those original stars will cause their spins to align giving the resulting binary black hole system only small misalignments. 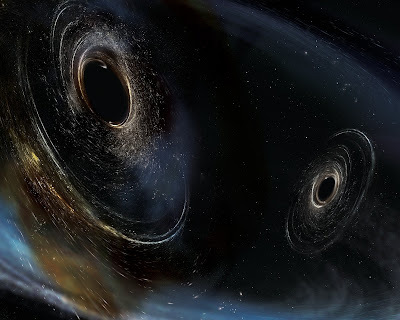 Another formation mechanism for binary black holes is that they just happened to pass one another while drifting through space and became gravitationally bound together (this is called dynamical assembly). We expect things like this to happen in dense stellar clusters or near the centers of galaxies. Since these would have had no interaction with each other before they became a system, we expect random spin alignments from the black holes. Ultimately we found that our system likely had a low total spin and was likely not aligned with the orbital angular momentum of the system. It is also possible that our black holes had no spin to begin with. So this isn't definitive, but we are starting to assemble the story of how black hole systems like this form. With this discovery, we are adding to our understanding of the universe and testing general relativity in ways we've never been able to before. The importance is that LIGO is truly operating as an observatory (that's what the 'O' in LIGO stands for after all) and building a database of observations. In astronomy, you can never make a single observation and understand a system's history. You need to take a large sample of observations from similar systems and find out what the patterns are. That's how we understand how stars evolve since a human life, or even all of human existence, isn't long enough to have followed a single star's life cycle. But because we have observed many stars in different stages of their lives we've discovered patterns. That's how we know that the black holes we just observed are the collapsed corpses of the extremely massive stars. Now we can collect observations of many of these black hole systems to learn more about black holes in general and how these pairs of black holes form. 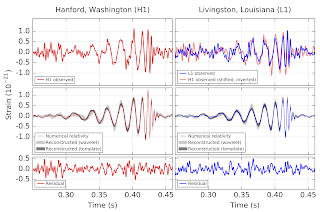 On September 14th, 2015, LIGO made the first direct detection of gravitational waves. This event is labeled GW150914 (referring to the year, month, and day of the detection). The objects that produced the GW150914 were a pair of stellar mass black holes that orbited each other and gradually moved closer and closer together over the course of eons. The closer together they became, the faster they orbited around each other and the stronger the gravitational waves produced. LIGO detected the last 0.2 seconds of these stars orbiting until they became so close they merged into a single black hole. While we saw the death of this paired (binary) system, we didn't get to observe other parts of its life. Where did these black holes come from? To answer this question, we need to apply what we know about stellar evolution. There are several classes of black holes, determined by their mass and how they were formed: stellar mass black holes, intermediate mass black holes, and supermassive black holes. For stellar mass black holes, they formed when the most massive of stars (more than 15-20 times the mass of our Sun) run out of nuclear fuel and gravity takes over and collapses the star. For smaller stars, this collapse stops when the pressure from inside the atom (neutron pressure) equals the pressure from the gravitational collapse. But for these more massive stars, there is no pressure that can stop the collapse and a black hole is formed. It is in this way stellar mass black holes are the corpses of the most massive stars (but these kinds of black holes are among the least massive). 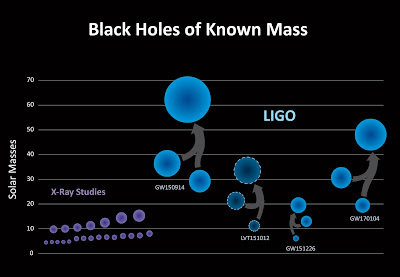 The newly merged GW150914 black hole now holds the record for the largest stellar mass black hole known. There are several theories about how this happens... Sometimes this collapse is accompanied by an explosion called a hypernova and is believed to be the source for a kind of gamma-ray burst. Sometimes the gravity of the collapsing star is so great that all of the matter and light gets sucked into it even if there was a hypernova-like explosion. But how did two stellar mass black holes come to be paired together? A likely explanation is that they also lived their lives together as a binary star system. This is very common as it is estimated that about 1 out of 3 stars are in systems of 2 or more stars. This binary system would likely have formed together and lived their entire lives paired. The more massive of the 2 stars would have died first since the more massive the star, the faster it burns through its fuel. Once the nuclear fuel ran out, the more massive star collapsed into a black hole making the system a star/black hole system. Eventually, the second star would run out of fuel and collapse into a black hole as well making our stellar black hole binary system. These black holes would orbit for eons before they were close enough to merge and produce the gravitational waves LIGO detected. In a recent paper (see reference below or read it here), simulations of millions of stars with different material compositions (specifically metalicity which, to an astronomer, is anything that isn't hydrogen or helium; the Sun is 2% 'metal') were simulated and some produced similar outcomes to what we observed. What was found was that there were similar characteristics for the stars the went on to resemble the GW150914 binary system and this gives us estimates on the time needed for each stage in the system's evolution from birth to the gravitational-wave-generating merger. The two stars were born about 2 billion years after the Big Bang and were each somewhere between 40 to 100 times the mass of our Sun. These low metalicity stars (only about 0.06% 'metal') orbit each other as stars for about 4 million years until the more massive one collapses into a black hole. The now star-black hole system orbit each other for another 1.5 million years until the other star collapses into a black hole. Both of these stars were massive enough that there wouldn't have been a hypernova-like explosion for either of them; any material ejected would have fallen back into the black hole. Our new black hole binary system, which is just the corpses of once very massive stars, now go on to orbit each other for over 10 billion years - that is 1000 times longer than the either star was a alive. At the end of that time, they merge and produce the gravitational waves that LIGO detected 1.3 billion years later when they arrived at Earth. The short answer: nothing. This new single black hole is spinning (it is the first detection of a Kerr rotating black hole) but its shape and center of mass are not moving in a way that will ever produce gravitational waves again. Gravitational waves are also the only way this system would ever have been detected since there wasn't any matter (like dust or gas) to fall into the black holes and generate X-rays. We will never be able to observe this black hole again. Of course, there are extremely unlikely events like another black hole flying by and crashing into it... That may make new gravitational waves for us to see (but I wouldn't hold my breath). K. Belczynski, D. Holz, T. Bulik, R. O'Shaughnessy, "The origin and evolution of LIGO's first gravitational-wave source" arXive e-Print: 1602.04531 (2016). 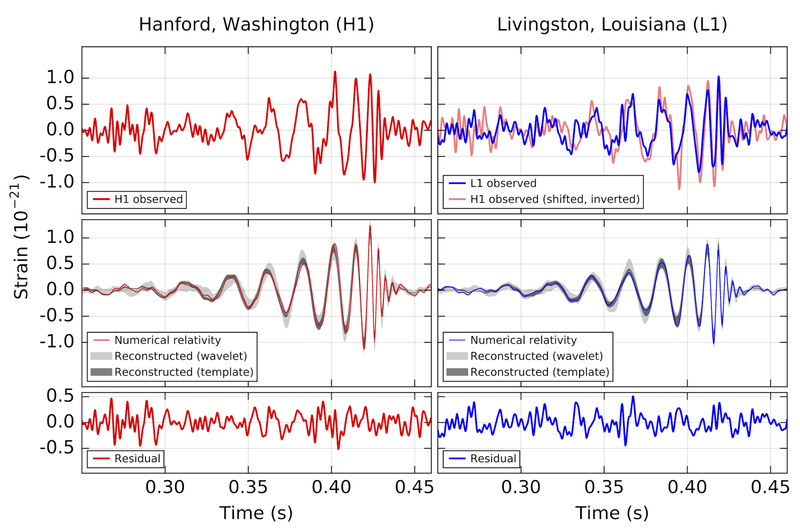 On morning of 14 September 2015 at almost 4:51 am in Louisiana (09:50:45 UTC) the LIGO detectors in Livingston, LA and Hanford, WA detected a gravitational-wave signal we've labeled GW150914 (based on the date). The online (near real-time) data analyses alerted scientists about 3 minutes later that there was something of substantial interest in the data. While vetting this signal (that only lasted about a half of a second) took a substantial amount of time, it opened the new field of gravitational-wave astronomy. We had not only made the first direct detection of gravitational waves but we also made the first direct detection of a black hole binary (pair) system and proved that these kinds of systems really do exist (it was contentious because the formation of one of the black holes was expected to have destroyed the star that would have made its partner). At the time of the posting of this blog, the press conference making the announcement is going on and I am working the satellite event being held at the Livingston Observatory. I will be sure to update this post with the link to the recording or the announcement later (update: see the bottom of this post). There is too much to talk about in just this post, so I am going to keep this to the basics: what did we see and what does it mean? I will be doing a series of posts about what we did to make sure that this is a real gravitational wave, the astrophysics of the source, how we detected it, the creation of black holes and why finding a pair like we did is important to astronomy. Update: Read the Physical Review Letters journal article here. This image shows the data (top row), signal (middle row), and what's left over after the signal is subtracted from the data (bottom row). Detailed discussion on each image is provided below. 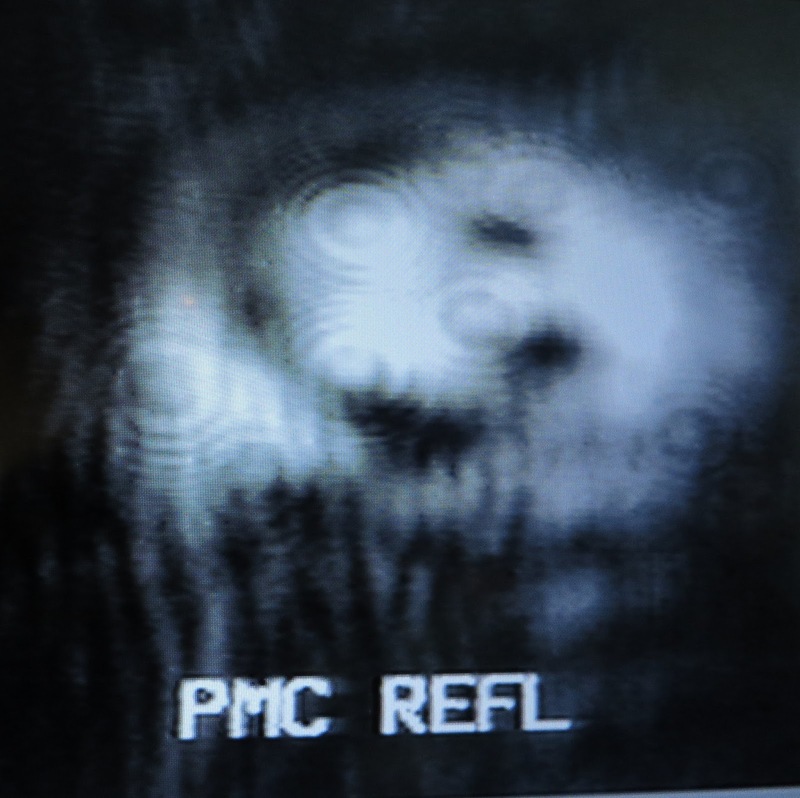 What you see here is a series of images (above and in detail below) that picks apart the signal that was detected. In the left column is information focusing on the Hanford Observatory and on the right the Livingston Observatory. The vertical (Y-axis) units are strain with a scale of 10-21. In the top row is the signal that was seen. However, this is not the raw data as it was collected. What you see here is data that has been filtered to 1) reduce noise and 2) to include only frequency components that are around the frequency range of the signal itself. The red graph on the left is the signal as seen at Hanford and on the left the blue trace is as seen at Livingston. For comparison, the light red line under the blue Livingston line is the Hanford signal that has been shifted in time to account for the travel time between detectors and flipped (multiplied by -1) to match the orientation of the arms (the arms of each site have a opposite orientation compared to each other so the positive signal in one detector will be negative in the other). The common signal can be seen with the noise in this comparison. These plots compare the signal predicted by numerical relativity (which are results of computer simulations where the predictions of general relativity cannot be solved by in explicit mathematical expressions) for a pair of black holes with one mass 36 times the mass of our Sun and the other 29 times. (The red line in the left plot for Hanford and the blue line on the right for Livingston.) 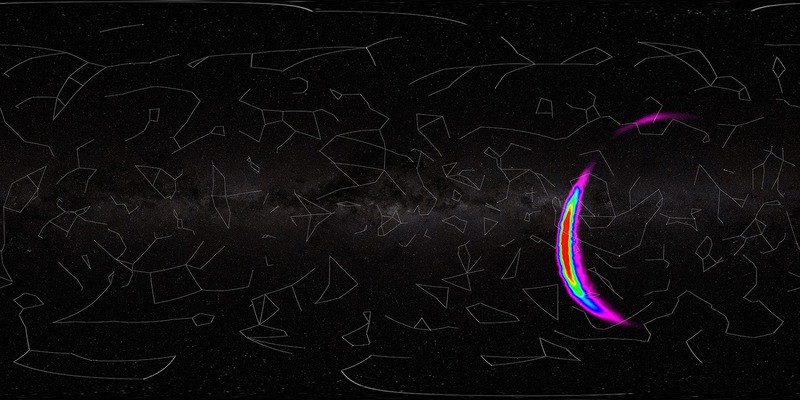 Beneath each of these lines are grey shadowed areas that show the signal as detected from actual LIGO data with two different independent data analysis methods (wavelet and template). Here again, we can see that the predictions and observations match well. These are plots of residual signals which are the noise that this left behind when the gravitational-wave signal is removed. Seeing that there is no pattern left in these plots supports that what was seen was a real common signal - a real gravitational wave (this is necessary for a gravitational wave detection but not sufficient - the extra investigations performed will be the subject of a future post). A powerful tool in signal analysis is breaking up a signal into its frequency components in a graph called a spectrogram. It allows us to see how much of a signal is made up different frequencies at different times. If you can hear, then you do this everyday. It is how you are able to pick apart the sound of a tuba from the sound of a flute when you listen to a symphony. Both are playing at the same time, but you don't confuse their sounds as coming from anything else. The horizontal (X-axis) is the progression of time (like above) and the vertical (Y-axis) is showing the contribution of each possible frequency. The more yellow at a frequency, the stronger that frequency's contribution to the signal at that time. Our gravitational wave starts at a low frequency (about 35 Hz) and increases to higher frequency (about 250 Hz) near the end of the signal. This is similar to a signal a slide whistle increasing tone would produce. As I've mentioned in a previous post, the frequencies of gravitational waves that LIGO is sensitive to would be audible if they were sound waves (which they aren't). Because of this, we can make them into sound waves by putting the signal through a speaker. So we did! Because the starting frequency of the gravitational wave is very low, it is difficult to hear. The frequency is audible, but at that low of a frequency we tend to feel the sound vibration more than we hear it. So unless you have a truly great subwoofer, you will probably only hear the end "whoop" of the signal. In order to make the entire signal more audible, we shifted all of the frequencies up in the above sound up so you can hear the whole thing. This is not unlike the false-color images made in astronomy for light that our eyes cannot see. Now that you've heard the detected gravitational wave, you can see that when the tone of it becomes higher toward the end of the signal, the frequency in the spectrogram also goes up. WHERE DID THE SIGNAL COME FROM? WHAT MADE THIS GRAVITATIONAL WAVE? Based on how strong we know these gravitational waves were at their source as predicted by general relativity and how strong they were once they reached Earth, we estimate that this system is located about 1.3 billion light years (~410 Mpc) away. That distance is about 10% of the way to the edge of the observable universe! It also means that the gravitational waves we just detected have been traveling into the universe and toward us for 1.3 billion years. When these gravitational wave were created the Earth was in the Proterozoic eon of Precambrian time, after when multicellular life developed but before animal life. Note: Fast forward to 26:30. It's just waiting before that. The first Advanced LIGO observing run (O1) started in mid-September and will end in mid-January. Today I want to tell you about how we collect our data. On the surface this is obvious: with computers and sensitive electronics. But how do we keep the detector working so that we can collect data and how do we know that our data is good? The LIGO Livingston control room on 3 November 2015 (during O1). The most important step in collecting data is that the detector is working. This is the primary job responsibility of the roughly 10 operators who work at the site. There are 3 10-hour shifts a day, each one overlapping with the previous operator's shift by 2 hours so that the incoming operator can be brought up to speed on any issues that may be ongoing. Since O1 will last into mid-January, that means that there will be at least the operator in the control room every night, weekend, and holiday - even during Thanksgiving dinner, Christmas morning, and New Years at midnight! During their shift, they monitor various things like the power of the laser, local vibrations, and a multitude of other readings from all over the detector that tend to drift over time. This work is mainly to prevent a fault in one of the systems that would interrupt data collection. When everything is working the way it is supposed to, this part of their job can be boring - and we love boring days and nights. Excitement happens when we are no longer able to keep the light bouncing back and forth between the mirrors (we call this "breaking lock"). The operator's job now is to respond by discovering if the lock was lost due to an environmental issue we can't control (like an earthquake anywhere on the planet) or due to an detector issue. If there is a malfunction in the detector, the operator identifies what subsystem caused the problem and then uses their training to fix it and get the detector up and running again. Through my conversations with them, one of the harder parts of their job is identifying which part of the detector isn't working properly since there are so many subsystems that need to work all at the same time for us to be able to collect data. During the Initial LIGO science runs, there were always 2 people in the control room: the operator and the "scimon" (short for science monitor). The scimon's job was to ensure the quality of the data that was being collected and give feedback to the operator. Scimons came from institutions across the country who would usually spend a week or two at the observatory before returning to their home. This meant that there were a lot of people passing though the observatory (which isn't bad) and by the time they really got comfortable in their job it was time for them to go home (this isn't good). We are doing the science monitoring differently for Advanced LIGO: we have longer-term (several months) visiting scientists (LSC Fellows) working on site to monitor the data as it is collected and we have data quality scientists (we call them "DQ Shifters") who remotely monitor the properties of the data for a period of 3-4 days. These scientists are on-site to monitor the data as it is collected and they also each have a project related to improving the instrument. There is almost always a fellow on-site except for the earliest hours of the day (they are not as necessary as the operator and their instrument research is best done when other scientists are also around). The fellows work with the operators to identify subsystems that may be causing issues and they work to resolve them. Basically, these are the Advanced LIGO version of the scimon but with the benefit of having the visiting scientist being able to apply what they learn while on site. The DQ shifter is a scientist who monitors the quality of the data that has already been taken (within about a day or so). Sometimes, patterns only become evident after a significant amount of data has been collected. Because this work is not expected to have immediate feedback to the operators and fellows, this work can be done remotely. We have created automated web pages that have all the plots needed to look at how the different parts of the detector are working. There are about 40 or so of us (including me) who have been trained on how to interpret all of the graphs that appear on these pages and what specific things we should be watching for. We communicate with the fellows at the site we are monitoring on a daily basis so that they can use the feedback to improve the quality of the data. When our shift is done (we usually cover 3-4 days in a shift), we document our findings, report to the data quality group who specializes in studying collected data, and we enter an entry in the detector log with a summary of our shift. Summary pages used by DQ Shifters to evaluate the quality of data already taken. 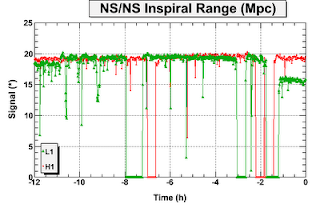 These plots specifically show how the ground was moving in different frequency bands throughout the day on 2 November 2015. First Science Data With Advanced LIGO is Near! 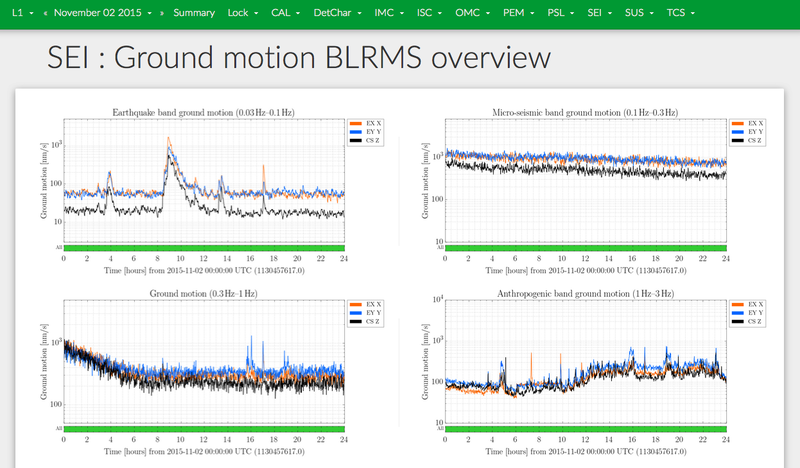 It has been a very exciting time for Advanced LIGO recently. A few weeks ago we completed a test run of the instrument to identify any remaining bugs in the instrument or other stability issues. 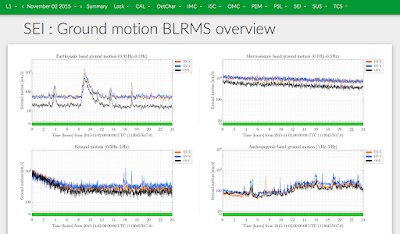 The commissioners (instrumental scientists who work on making LIGO more sensitive) have been busy adjusting various settings in a multitude of subsystems to increase our sensitivity to gravitational waves. We are continuously learning more about how all of these subsystems react to one another and to the environment. And learning is never without its own pains. Some bugs have been bigger than others. We've had to actually touch the new instrumentation - meaning we had to seal off the chamber the part was in, let the air back in (since almost all of the instrument is in a vacuum), fix it, close up the chamber, and pump the air back out. This is rare but it has happened. Once the instrument was performing well, that's when we decided to stop tinkering with it and use it like we would if we were looking for gravitational waves. More subtle issues in stability and other bugs will make themselves apparent only after you use it the way it's meant to be used - all the time. Installing one of Advanced LIGO's seismic isolation platforms at the Hanford observatory in 2013. These test runs are called engineering runs. We abbreviate them ER followed by the number of the run. The last one was called ER8. 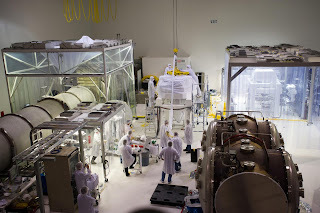 I've already talked about the first one (ER1) back when almost everything was being simulated since the installation of the instruments was just getting off the ground. The purpose of those early engineering runs was to test out the ability of our data analysis systems to handle the large amount of data we will collect. As parts of aLIGO were installed, we replaced the simulated data from that component with real data. ER8 was our first test of all of the instrument without anything being simulated. While the purpose of this data is to test the stability of the whole system and to find other small bugs, we are still running all of our data analysis methods over the collected data. 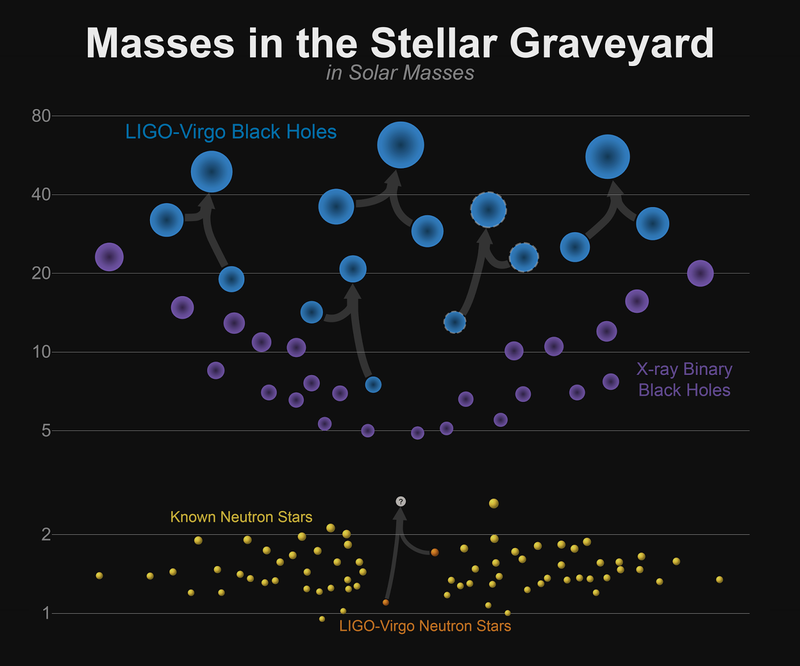 We don't expect to find a gravitational wave in this data, but if we have compelling reason to believe that we really did see something we will certainly pursue it as a real detection. Don't get too excited, though, since there are no indications that we collected a gravitational wave. What is really exciting is that we are preparing to make that first detection. We don't really expect to detect a gravitational wave with our first science data (which will be called O1 - observation 1) with aLIGO but it is not as improbable as it was with Initial LIGO. We are talking about what we learned from the blind injection in our last iLIGO data set (otherwise known as the "Big Dog" event) and what our detection validation should entail. We are talking about writing the paper that we will publish announcing the first detection and its details. We are even talking about how we will engage the public with this announcement. Don't misunderstand me - we have not seen anything yet, but we are preparing ourselves for the possibility of detection. You really don't have any idea how exciting this is especially for those of us who have been around a while (I have been working on LIGO since starting grad school in 1999 and I'm a youngster). I have been working on this project that is so much bigger than myself since before we took our first data with Initial LIGO. I remember when the collaboration was a couple hundred scientists (there are now almost 1000 of us). I remember when we analyzed our first data and debated how to interpret our detection candidates when we almost sure that everything we had was noise (i.e. garbage). Now we are talking about confidently making a detection, and doing astronomy with it. This is the dawn of a new age in astronomy and I'm proud to be here to see it. aLIGO wil be able to "see" up to 200 Mpc (about 650 million light years). Remember, we don't expect a detection, but it is possible. To give you an idea of how possible, once we have aLIGO working at the sensitivity it was designed to work at, it will observe as much of the universe in several hours as Initial LIGO did in an entire year. We won't be at design sensitivity for O1, but we can already detect our standard source 4 times farther away than we could on our best days with Initial LIGO. An image of light that was filtered out of the laser before entering the LIGO detector. Bend your neck to the right and you should be able to see a smiley face. This is just a chance configuration and has no significance, but we thought it was cool.